The Republic of Austria is a largely alpine and mountainous country marked by deep valleys, verdant meadows, and lush forests. It is divided into nine Bundesländer (federal provinces): Burgenland, Carinthia, Lower Austria, Upper Austria, Salzburg, Styria, Tyrol, Vorarlberg, and Vienna. Austria has two distinct climate zones. Most of the country has a typical Central European climate with cold, snowy winters and warm, sunny summers. While the eastern parts of Austria, enjoy more moderate winters and hot, humid summers. It's an excellent climate for wine-growing, hence the extensive vineyards of Burgenland. The alpine provinces, particularly Salzburg, Tyrol, and Vorarlberg, best exhibit the majestic scenery that Austria is famous for worldwide. These provinces are also popular winter vacation areas, and draw hordes of tourists to their many high-class ski resorts. Culture, art and music go together whenever Austria is mentioned. Its cultural institutions are heavily funded by the public, and education from primary school to university is either free or highly subsidized. Austria's cosmopolitan cities have nurtured some of the greatest names in classical music: Beethoven, Mozart, Haydn, Brahms, Schubert, Schönberg, Mahler, and both Strausses. 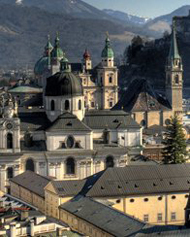 Theatre, opera, musical concerts, and various cultural festivals can be enjoyed throughout the country, especially in the cities of Vienna, Salzburg, and Linz. 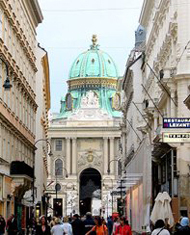 Vienna also offers a flourishing English-language cultural scene; the city has a number of theatres and cinemas that show English-language stage productions and films. 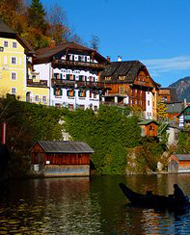 Austria is also filled with art and architectural treasures. Many of its major cities, such as Vienna, Salzburg and Graz, have beautiful and well-preserved historic centres where you will find masterpieces of Baroque architecture. Austria's history is associated with one name - the Hapsburgs. After the defeat of Ottokar I of Bohemia in 1278, the Hapsburgs ruled Austria till 1918. The story of the Hapsburgs is a series of advantageous marriages. From their heartland in the Duchy of Austria, they acquired most of the Netherlands by marriage (1477), then Spain, then in 1526 won Bohemia and part of Hungary by battle. Charles VI and Joseph IThe great Baroque buildings of the architect Johann Bernhard Fischer von Erlach (1656 - 1723) are the most visible legacy of the reigns of Charles VI and Joseph I. Fischer von Erlach's achievements include the Winter Palace for Prince Eugen of Savoy, the Dreifaltigkeitskirche in Salzburg, Schloss Klessheim, the Clam-Gallas Palace in Prague, and in Vienna Schoenbrunn Palace, the Spanish Riding School and above all, the Karlskirche. Yet perhaps the high point of Hapsburgs was the rule of the devoutly Catholic Maria Theresa (1717-1780). Maria Theresa successfully fought off Prussian attacks; promoted commerce, developed medicine, ameliorated the position of the serfs, expanded the army, and patronized the arts. Joseph IIHer successor Joseph II (1941-1790) took her modernizing reforms much further. A child of the Enlightenment, on the death of his mother in 1780 he moved swiftly to emancipate the peasants, secularize church lands, introduce religions toleration, reform tax to weaken the medieval guilds, and abolish the death penalty. In no less than 6,000 edicts, Joseph II reorganized the Empire and centralized authority, stripping the Hungarian assembly of its authority, making German compulsory throughout the Imperial civil service, and bringing in compulsory elementary education - in German - throughout the Empire. In foreign policy, he was highly militant and expansionist. Joseph II's radical policies alienated everyone, the nobility, the regions, the religious conservatives, and even ordinary people, who resented the flood of minute regulation. By the time he died in 1790, rebellions were breaking out all over the Empire. From then on it was reaction all the way. Leopold I and Francis IILeopold I (1790-92), Joseph II's brother, made concessions to the nobility and language groups. After his death, his son Francis II (1792-1835) pursued a sternly conservative course, fighting revolutionary France four times, till victory was cemented by the Congress of Vienna (1815), when Francis II's representative, Clemens von Metternich, coordinated an era of inter-monarchical conservative repression in Europe, supported by a highly effective secret police. After the feeble-minded Ferdinand I (1835-1848) was prompted to abdicate following the revolutions of 1848, his nephew Franz Joseph I (1848-1916) took over. Franz Joseph IFranz Joseph I consolidated his military position with campaigns against the Hungarians, then suspended the liberal constitution. During his absolutist rule he became well-respected, but the assassination of his nephew Archduke Franz Ferdinand, by a Serb in Sarajevo, led to World War 1, and ultimately to Austria's defeat, and the Hapsburg monarchy's end. In 1918 a democratic republic was declared, and Austria became part of the new German Republic. However the Allied-imposed settlement separated Austria from Germany, creating the first Republic of Austria (1919). The settlement left over 3 million German Austrians outside Austria, in Czechoslovakia, Yugoslavia, Hungary and Italy, with terrible future consequences. After Hitler was elected as chancellor of Germany in 1933, Chancellor Engelbert Dolfuss established a pro-German autocratic regime in Austria. His successor Kurt Schuschnigg struggled to keep Austria independent. In 1938 German troops occupied Austria, and it creased to exist as an independent state. Independence A democratic constitution was reintroduced by the allies, and in 1955 Austria regained full independence. The political system came to be characterized by Proporz, a system of division of spoils with political posts split between members of the Social Democrats and the People's Party, though this system was challenged by the Freedom Party (FP) originally headed by Jorg Haider. Austria became a member of the EU in 1995. Austria has had a highly successful post-war experience. The economy was originally weighed down by socialist regulation, but was subsequently liberalized. Tourism has been a large stimulus. In the sequel to the collapse of communism, Austria benefited from its position in the heart of the former East Europe. 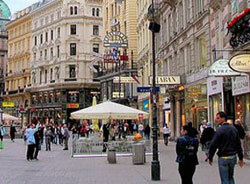 Austria TodayAustria is now one of the world's ten richest countries, in terms of GDP per capita. The cost of living in Austria can be described as mid-range; however, its capital city, Vienna, is fairly expensive, ranking 19th out of the world's 50 most expensive cities in the Mercer Cost of Living Survey 2008. Austria's rural areas are somewhat less expensive to live in, but if you need to commute to the city, you may face high transportation costs. Before you rule out a Viennese lifestyle though, take note that Mercer also ranked Vienna 2nd in Europe on its 2008 Quality of Living Survey. Austria is a very safe country. Vienna ranks 6th out of the top 50 cities for personal safety on Mercer's 2008 survey.